NEW YORK--(BUSINESS WIRE)--JetBlue (Nasdaq: JBLU) today announced a ten-year renewable jet fuel purchase agreement with SG Preston, a bioenergy company. The airline is partnering with SG Preston to purchase renewable jet fuel made from rapidly renewable, bio-based feedstocks that do not compete with food production. This marks one of the largest renewable jet fuel purchase agreements in aviation history, and the largest, long-term, binding commitment by any airline globally for HEFA (hydro-processed esters and fatty acids) based renewable jet fuel. For nearly 100 years, planes have run on fossil fuels. Investments in renewable energy sources are key to a lower carbon future. Renewable jet fuel is produced from biological resources, like plant matter, which can be replenished rapidly and without impacting food supply. With SG Preston, JetBlue is creating renewable jet fuel that has the ability to benefit the airline’s bottom line while also lowering its net CO2 emissions. Compared to traditional petroleum-based Jet-A fuel, renewable options can significantly reduce emissions, including pollutants related to air quality as well as net greenhouse gases. Renewable jet fuel is chemically equivalent to conventional Jet-A fuel, and poses no discernable difference in performance or safety. JetBlue is taking a long-term approach, evaluating various technologies, materials and feedstocks. To launch the strategic relationship with SG Preston, JetBlue plans to purchase more than 33 million gallons of blended jet fuel per year for at least 10 years. The fuel will consist of 30 percent renewable jet fuel blended with 70 percent traditional Jet-A fuel. The renewable jet fuel portion produced from select plant oils is targeted to achieve a 50% or higher reduction in greenhouse gases emissions per gallon based on a life-cycle analysis. The fuel is expected to meet the Environmental Protection Agency’s (EPA) qualification for renewable fuel standards, as well as the Roundtable on Sustainable Biomaterials certification standard for sustainable production of biofuels. 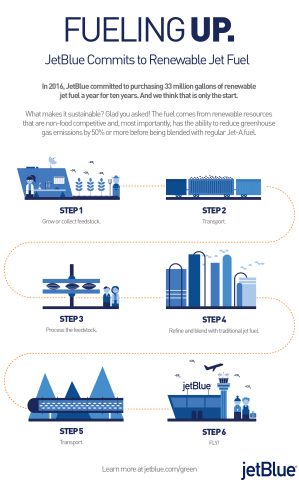 With an aviation industry-wide goal to cap net greenhouse gas growth from 2020 onward, renewable jet fuel is a key aspect of JetBlue’s emissions reduction strategy. The Federal Aviation Administration (FAA) has approved renewable jet fuel safe for use. JetBlue business partners have tested the type of renewable jet fuel associated with this deal and qualified it for use in 2011 via industry evaluations that took place as part of the alternative fuels approval process of ASTM International, the standard-setting body for fuels used by the aviation enterprise. To date, more than 2,200 commercial, revenue flights by 22 airlines have flown on different types of renewable jet fuel, with many of those flights being flown with the HEFA-SPK type fuel to be produced by SG Preston. “This is a first of many steps towards a slowly evolving change. With our partner, SG Preston, we are pursuing renewable jet fuel production from feedstock systems with the ability to lower CO2 emissions by 50 percent or more per gallon before blending. This is a proactive step to address customer demand and protect our business and the future of our industry,” said Hayes. JetBlue believes in communicating transparently about climate change. The airline is committed to taking steps to address the emission of greenhouse gases (GHGs) from its flights and JetBlue empowers and inspires its customers and crewmembers to offset GHG emissions when they fly. The airline is constantly looking for ways to become more fuel efficient and embrace more efficient technologies. For example, JetBlue planes feature Airbus' Sharklets, which improve aerodynamics and cut fuel burn and emissions. For more on JetBlue’s work to reduce emissions, visit jetblue.com/green. JetBlue is New York's Hometown Airline® and a leading carrier in Boston, Fort Lauderdale/Hollywood, Los Angeles (Long Beach), Orlando and San Juan. JetBlue carries more than 32 million customers a year to 97 cities in the U.S., Caribbean, and Latin America with an average of 925 daily flights. For more information, please visit JetBlue.com. SG Preston is a bioenergy leader unlocking the potential of renewable biomass through an intelligent and integrated logistics and product development system. SG Preston knows what it takes to make renewable energy a reality at commercial scale, and how to make it work long-term. We impart a spirit of partnership in every project — taking into careful consideration the needs of all stakeholders — to develop bioenergy solutions as integrative as they are innovative. SG Preston has a strategic goal to develop 1.2 billion gallons of renewable biofuels to help major stakeholders in the transportation and related industries meet their strategic goals. For more information, please visit SGPreston.com.